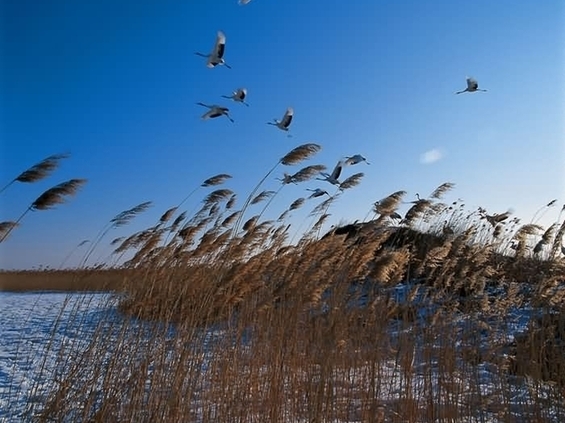 Authorities in northeast Heilongjiang Province said Wednesday they have launched a crackdown on illegal wetland cultivation in response to widespread media reports last week that dozens of hectares of wetland were turned into arable land on two nature reserves. Chu Hexin, a water breeding contractor in Shilipao Wetland in the city of Tongjiang, was found to have opened up nearly 19 hectares of wetland amid the crackdown launched by local environmental protection and police departments, according to a spokesman with the Tongjiang city government. "The soybean plants on the wetland-turned farmland have been wiped out, but we still have to wait to see whether those lands can recover completely," the spokesman said. The wetland belongs to the Bacha Island National Nature Reserve, which was set up in 1999 and has more than 28,000 hectares of wetland and 15,000 hectares of water surface. The Tongjian city government, which is in charge of the Bacha Island National Nature Reserve, also plans to launch a massive inspection over the wetland this year. Meanwhile, a village-based environmental education program will be carried out to explain the perils of destroying wetlands. With soaring food and land prices, more and more farmers are taking risks to open up wetlands illegally in Heilongjiang. Thirty people were sentenced for such crimes between 2006 and 2009 in a neighboring national nature reserve.